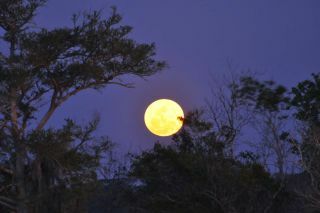 The full moon rises behind some trees in this photo taken by skywatcher Brad Ervin in Bruswick, Georgia on March 19, 2011, when the moon was closer to Earth than it had been in 18 years. The orbit of the moon around the Earth is not a perfect circle so the distance varies a little. The average distance is around 384,400 kilometers or 230,600 miles. When NASA's Apollo astronauts flew to the moon in the late 1960s and early 1970s, it took them three days to reach the moon and enter orbit after launch. Did you know that the moon is moving away from Earth? It moves away at about 3.8 centimeters per year.